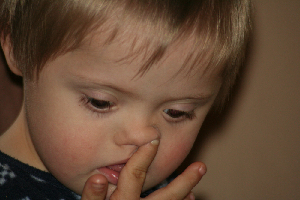 Home 43 , 44 My Down Syndrome baby is perfect! My Down Syndrome baby is perfect! I received this email from a 51 year old mom who wanted to share her story. She didn't leave an a name or email address, but asked me to contact her by phone. Unfortunately I don't have any budget for long distance or overseas calls - sorry! But I am very happy to share her story. I hope she sees it in print! My rage was caused by an article on the AmazingPregnancy.com site I, by chance, stumbled across, giving statistics of the chance of having a Downs baby. I can't remember the age it was referring to but it said, and I quote the chances of having a downs syndrome baby are one in a hundred, but don't forget the other 99 babies will be PERFECT. OMG - perfect - is there such a thing? And what wording they'll be perfect ? What's the Downs baby, damaged goods, a reject, the runt of the litter, imperfect? I'm sorry for that outburst, but I think you would love to hear about my AMAZING pregnancies. I have had every complication in the book, and I mean every. I am 51 years old in June, and I have had four boys ages 27, 24, 13, seven years old! And three miscarriages, all in different stages of the pregnancies. I first got pregnant at 17 years old, ending in a horrific experience of a 19 week miscarriage. Then at 24, after vowing never to get pregnant again, I had my 1st son, sailed through the pregnancy then he was two weeks late - long painful labour and vowed again NEVER haha. Second son - I was 26 unbelievably planned, horrific pregnancy, undiagnosed gestational diabetes till I was 22 weeks, and had a hypo in the middle of a busy shopping centre. Most of the rest of the pregnancy in hospital, and an early induction which medical staff thought would be safer for me and him. One month old (and a long story itself) it was confirmed that he had Downs... I was 26!!! Another miscarriage 11 years later, this time at 12 weeks. Then an almost instant pregnancy. At eight weeks, I began to bleed - they scanned me, and I was having twins!!! I lost one even after bed rest for two weeks. Luckily they weren't identical, and somehow my 3rd son was born... I was 37. But I'd had my son, so it was a terrifying experience for my family as specialists fought to save me. I lay in a coma in intensive care, blissfully unaware of the battle they had to save me. After I finally came home, three weeks later, my husband suggested as we laid in luxury in a really superb hotel that I'd had booked for months (I was a travel agent and was part of a franchise on teletext ). So I got the room as a concession for our wedding anniversary, yes he thought it would be nice to take the kids to the Canaries for a well earned break a couple of months later when the baby was allowed to fly. My mum came just to relax and look after the baby, so we could spend some quality time with the other two. We went ahead with the holiday, as I felt fine and luckily even though it was sad I still managed to have a relaxing break. Life carried on as normal. My son with Downs was so good. Really intelligent, he went to a mainstream school part time, and was keeping up with his peers. He had to, as our family life was so hectic he was just treated the same - in fact I never thought of him as different. He got no special treatment and had to do the same as his brothers there just wasn't enough time to treat him different , and it paid off for both him and all the family. To my shock and disbelief, I found myself at 43 years old, pregnant again. What a nightmare that felt at the time. This couldn't be true, I told myself. Trying to convince myself (truthfully) that both the tests were faulty, and the missed periods were the change in life. I was really convinced, well tried to, that it was wrong - and the funniest thing was that I was like a teenager. Scared to tell my family - after all those days were over - my three sons were 19, 17, and six years old. The pregnancy (yep I was, haha) was awful. I was in and out of hospital, diabetic again but this time diagnosed early. I was on insulin, lots of kidney infections. At 35 weeks, they decided that it would be better all round if they induced me - as I seemed to be really ill most of the time. I was given a day, and I was given one dose of the gel, and a drip to start the labour. That was bad enough. But after another dose, and me weak, the medical staff decided that after three days and two centimeters only that - due to the circumstances - they would give me an emergency c-section. I was shocked though, as he was so small and early, yet he was fit and healthy and after three days!!! They let me take him home. No one could believe he was home so quickly. All the clothes that we had bought for a newborn had to be put away. But luckily I had good friends and family, and he soon had a wardrobe full of tiny baby clothes. And just to finish on a great note - Michael, my son with Downs , the one who wasn't perfect , won a place at a Horticultural College, won two golds in the Special Olympics, finished college, got a job and then broke the news that him and his two friends were going to rent a house together. They pay all their own bills, cook all the meals and do all the housework. They go on lots of holidays, have a fantastic social life. Mikey has a girlfriend, they both go to a drama school as well. Mike is also in St. Johns Ambulance and although they are supervised, their carers will tell you that really all their job is to make sure the three lads are safe. So OK, Michael might have an extra chromosome, but you'd go a long way to find a lad who is thought so well of and achieved what he has, and never let's anything get him down. He's the perfect one and the last laughs on me, for the normal childhood he received. He makes me so proud. Anyway that's my story. Of course there's a lot more to it than I could type. Just remember there's nothing written in stone to predict what happens in life. So just enjoy it while you can. After all, my poor mum and dad had to bury my sister who died suddenly aged 36 years old, that's not supposed to happen - is it! ?